Google is going after several popular typos of the web address YouTube.com, all owned by the same person. Each typo domain leads unsuspecting users to a site that looks confusingly similar to the official YouTube site (as shown in the picture above of YouTub.com – minus the ‘e’). Instead of landing on Google’s YouTube, users are taken to a survey scam that asks a series of questions and attempts to gather personal information by promising free gifts like Best Buy gift cards. Google filed the complaint (Case No. 1416796) with the National Arbitration Forum this past week over the domain names: youtbe.com, youtub.com, youtue.com, youube.com, and yutube.com. The names are all registered to the same person as seen in WHOIS records, allowing Google to file one complaint that relates to more than one domain name, under UDRP rules. According to rough traffic estimates provided by Compete.com, visitors number in the thousands to each site every month. 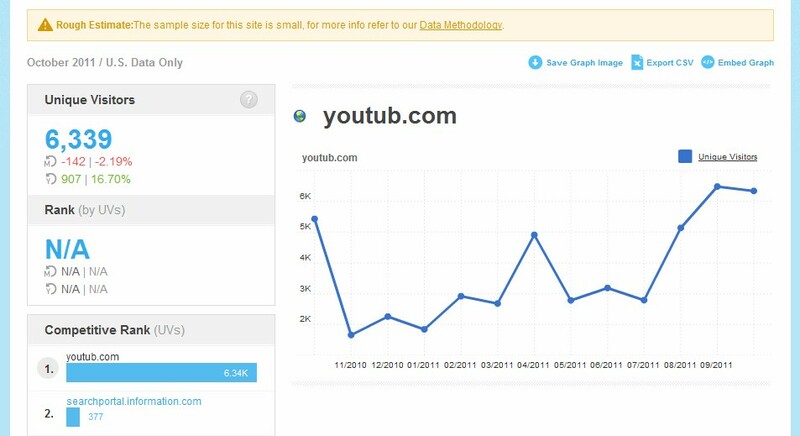 In October for example, YouTub.com reported over 6,000 unique visitors. If all three elements are satisfied, then the domain names will be ordered transferred to Google. This will likely be an open-and-shut case for Google. Earlier this month, Twitter Inc. won a similar dispute over the highly trafficked domain Twiter.com after filing a complaint with the World Intellectual Property Organization (WIPO). I’ve reached out to the owner of the disputed domain names for comment, and will update this story if I hear back. Google had its own share of problems with the YouTube web address early on, but it found itself on the other side of a dispute. Just weeks after acquiring the video site, Universal Tube & Rollform Equipment filed a lawsuit in 2006 after its site (utube.com) continuously crashed because of millions of people looking for YouTube. Universal Tube ended up using utubeonline.com for its business web address, and kept ownership of utube.com – a site that today averages a million visitors per month according to Compete. I read this eariler today. I was just wondering what took them so long? All the domains mention are really great ‘type O’s” for “YouTube”, and had to been first “reg’ an few years ago, at least…I would have to think. Maybe it is possible, they were recently transfered from the orginal person that had ‘reg’ them, and with that and this high profile ‘red flag’ landing page…did them in. I would have to find it hard to beleive, that this exact thing had been going on for years, without Google taken notice.